Rome is the setting for some quirky characters and an English language newspaper around which eleven short stories are based. 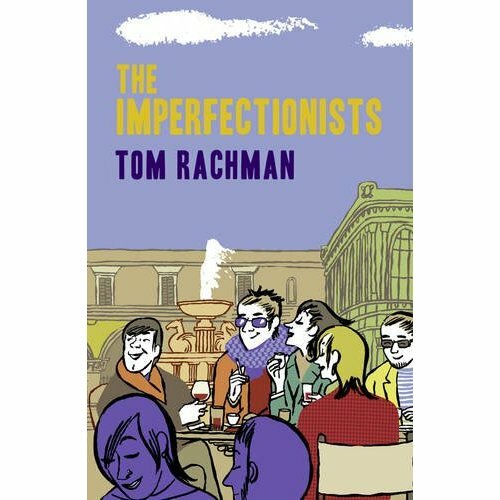 The book is the Imperfectionists and it is the first one by English born Tom Rachman. The author was raised in Vancouver and spent his professional life as a journalist. He was stationed in Rome when he worked for the Associated Press, and lived in Paris, where he was editor for the International Herald Tribune. I received the book last week from my sister who works for an English language newspaper in Brussels. The book made its way around the homes of a couple of editors who found it very readable and indeed Rachman can certainly write. His character descriptions are concise and vivid while the storylines are brief and to the point. Each short story / chapter is based around an employee at the newspaper and introduced with a quotation. “Bush Slumps to New Low in Polls” Paris Correspondent – Lloyd Burko, is how the first story is introduced. A narrative about the newspaper is sandwiched between tales of its employees and as a structure it fits well. Nostalgia blends in with the romanticism of the culturally resplendent Rome and before we even get to the enthusiasm of the newly established paper we are plunged into the misery of the characters’ lives. It’s not actually misery though, it’s just a slow falling apart of peoples expectations and aspirations. Actually not even a falling apart. People are not happy but they don’t know it or don’t reflect on it. The balance between the reflections by the characters and their behaviours is perfectly worked so that the stories never slow down. The first couple of stories are interesting and I felt let down when the Obituary Writer and the Business Reporter were let down. After a few people though I became a little tired of being disappointed along with them. Was no one destined to be happy? All staff appear to be so miserable that by the end of the book the demise of the media is dragged along into their story. Rachman brings up the modern issues confronting newspapers such as dropping sales and loss of ad revenue. This newspaper does not even have a website and its inability to move with the times is just one more symptom. The newspaper stays as the background however and it’s with the personal lives that Rachman mostly works. His depictions now and then become caricatures such as the arrogant, invasive and foolhardy foreign correspondent that takes advantage of an innocent stringer in Egypt. Nearly every woman has a bitter, interior monologue about how disappointed they are with their personal lives. The only character who is able to express his emotions clearly is an ex-journalist working for the Italian Prime Minister. My favourite character was Herman, the corrections editor, who got his break as a proofreader and found he had a knack for it, “finally, arcane knowledge and pedantry came in handy”. Rachman’s introduction of his characters is seamless enough to make the stories feel like a novel. His writing is very readable and the beautifully polished publication was released in 10 countries. I was happy to read it but there is still great potential from this writer. This is his first but not yet his best work. This entry was posted in Writing and tagged Book Review, Imperfectionists, Journalism, newspaper, novel, Rachman. Bookmark the permalink.